The settled residents of Abyei wait patiently, but not without frustration, for the international community’s acceptance of the October 2013 Abyei community referendum results. There can be neither security nor peace for local residents until the status of their area is resolved. In the meantime, attacks by armed Misseriya militia continue, perpetuating fear, especially in the current dry season where people are vulnerable to attack as they venture into the bush to gather grass and other building materials. Despite this, for those living in Abyei town and surrounding villages life continues: children are returning to school in February, people are continuing to cultivate the land and to rebuild houses. The World Food Programme’s (WFP) “Abyei Integrated Rapid Food Security and Nutrition Assessment” dated July 2014, makes recommendations benefiting militia posing as civilians in northern parts of Abyei Area, South Sudan. This same militia have recently made attacks on the settled Ngok residents. Last week two men were abducted by the militia near Dungop, and one boy was shot and injured. The assessment recommends the installation of clinics, agro-businesses and boreholes to support their illegal settlements, at a time when the WFP appears to have decreased food distribution to the settled civilians in Abyei Area. Such interventions undermine the political solution to the problem of Abyei proposed by the African Union and UN, and risk antagonising the settled community who may look for less peaceful means of bringing resolution to the status of their area. The AUHIP proposal, which guaranteed the settled Ngok Dinka residents self-determination, and guaranteed Misseriya nomads access and grazing rights, remains the only workable solution. No Ngok Dinka were given chance to take part in the assessment or feed into the report, and although the report bears the logo of AJOC (Abyei Joint Oversight Committee) as well as WFP, only Sudanese AJOC members were involved, whose participation was said to be ‘instrumental’ in selecting and preparing the communities to be surveyed. South Sudanese AJOC members were not consulted and had no chance to correct the obvious errors contained within the report. Sudanese Armed Forces Military Observers also assisted the team while SPLA military observers were not present; this involvement risks eroding the civilian/military distinction that aid agencies should be careful to preserve, and may have directly influenced the team and those surveyed. Errors include the claim that Misseriya have been settled in northern parts of Abyei Area since the 1980s, directly refuted by Episcopal and Catholic church leaders who travelled through the same locations regularly en route to Muglad and El Obeid in the early 2000s and report that Misseriya were not settled there at this time. Local information collected from those surveyed about harvests and seasonal patterns of life cover the last 3 – 4 years only. Dinka Ngok accept that the Sudanese government has been illegally settling militia and some civilians in these areas since 2010. The report also notes the ‘presence of South Sudanese within the population and according to FGD findings… coexisting without incident’ (p15). As there are no Dinka Ngok in the locations surveyed, these must be Twic Dinka militia of Thomas Thiel. The assessment team admit that they were only able to visit 6 out of the 29 locations that they accepted population figures for. Local residents suspect that this is because the AJOC and SAF members who accompanied the team were unable to disguise the military character of other settlements. Militia use the illegal settlements as a base to attack and destabilise populations in Abyei town and surrounding villages. The discourse of the report, which repeatedly refers to ‘northern Abyei’ and ‘southern Abyei’, promotes a solution which has already been dismissed – further redivision of Abyei Area into Sudanese/Misseriya and South Sudanese/Ngok areas. This solution is harmful for many reasons, including that it undermines the Permanent Court of Arbitration judgement on the boundaries of the 9 Ngok Dinka Chiefdoms of Abyei; is not acceptable to the settled community in Abyei; and would make conflict along the new border more likely. Furthermore, it would not serve the interests of genuine nomads who need to travel through Abyei into South Sudan to access grazing land in the dry season – access to the northern part of Abyei only would not be sufficient. We hope to see this report revised substantially, and that its current inaccurate and damaging content will not be used as a basis for supporting the settlement of militia in Abyei Area. No further food distribution should take place in the northern locations within Abyei Area, and donors should consider withholding support for programmes in these locations until this happens. 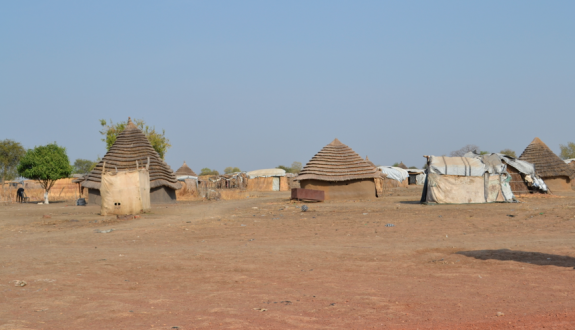 Support to villages of settled residents in Abyei town and the villages east of it – including Mijak, Rumamer, Marial Achaak and Dungop – should not be reduced. 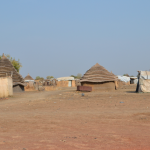 Tim and Hannah Flatman partner with local churches in Abyei Area to support the displaced and returning population, including by prayer, advocacy and small-scale relief and development work. They were international observers for the referendum carried out in October 2013.